Perennial. Zone 2. Asteraceae. (Syn. Compositae.) Widespread through Western North America. Common to wet coniferous forest and subalpine regions of B.C. A.k.a. Alpine Coltsfoot, Arctic Butterbur. With the departure of the last of the sodden winter snow and the first faint flush of green as plants awake from their long dormancy, the sudden appearance of the exotic-looking coltsfoot bloom stems is a welcome surprise to the keen native plant gardener or roving botanist. Thick, fleshy stems appear, lined with bract-like leaves and topped by clusters of densely packed disc flowers. Plants are either male, with all disk flowers, or female, with ray as well as disk flowers, as in the photo above. This plant’s membership in the Composite Family (think sunflowers, Helianthus annuus, as the poster child of the composites with well-differentiated ray and disk flowers in a single head) is very obvious once one takes a close look at the flower structure, and especially when the feathery, dandelion-like seeds start to mature. Blooms are most frequently white, but can be shades of pink, and occasionally a deep ivory-yellow. 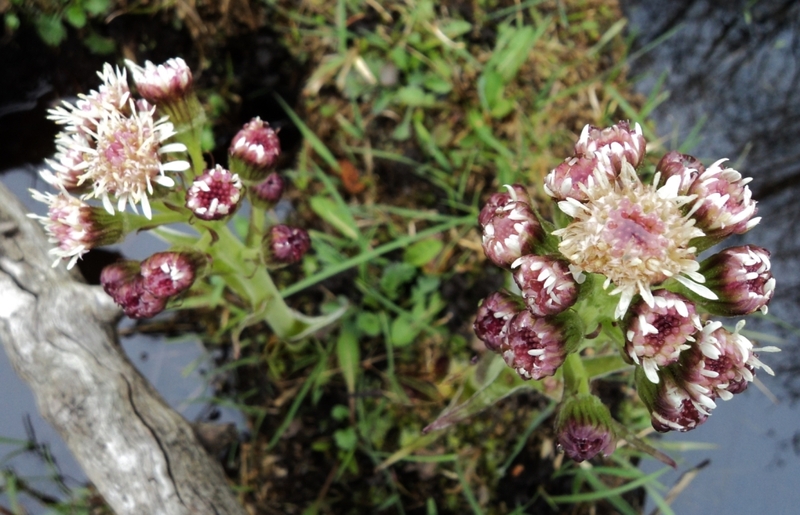 Leaves appear a few weeks after the bloom stems, and as they often arise at some distance from the flowers due to the plant’s extended underground rhizomatous root system they are often not associated with the flowers. 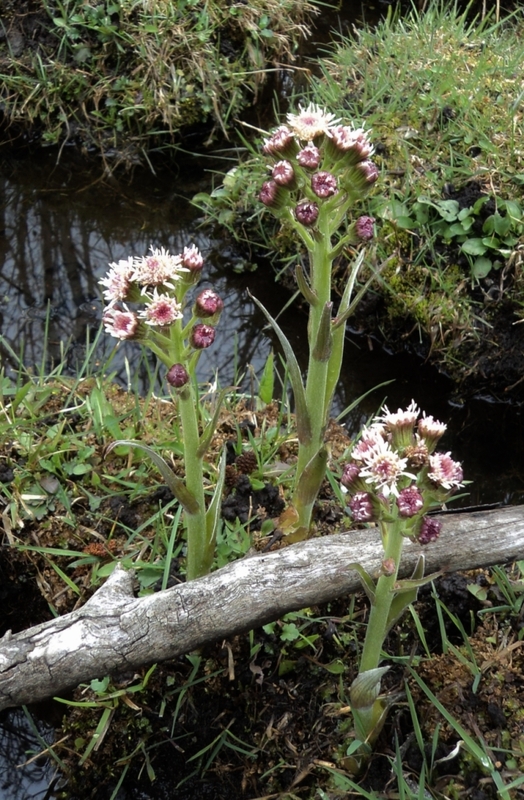 Many of the Petasites have massive foliage – the leaves of the vigorous Japanese Butterbur, Petasites japonicus, easily reaching 2 feet across, and those of another common British Columbia species, P. palmatus, often reaching a foot wide – but P. frigidus var. nivalis is a more modest creature, with glossy, deeply wrinkled, raggedly toothed, grape-like leaves only 6 to 8 inches across. Soon after the appearance of the flowering stems, stout leaf-shoots emerge. They are folded in an extraordinary manner, with the hairy lobes reflexed, at an early stage evoking the metaphor of the little foot of a colt. 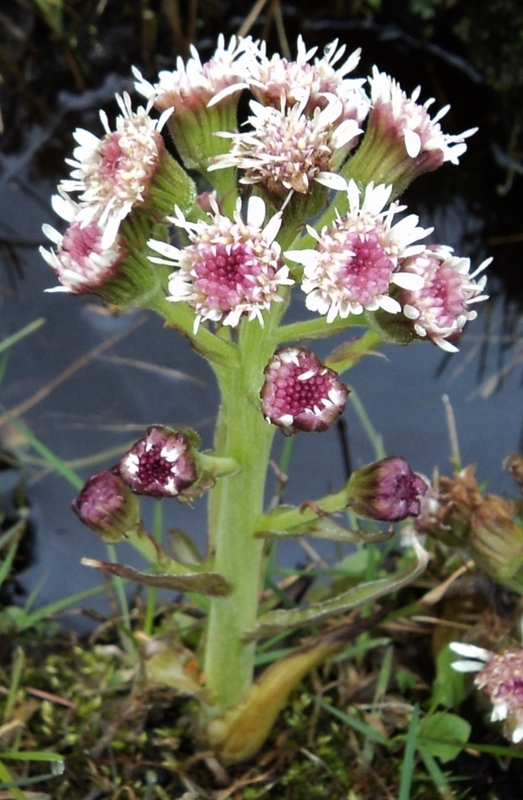 Sweet Coltsfoot is often found in wet locations, thriving in boggy areas and on stream and lake edges. It is something of a spreader, forming thriving colonies where happy, and is occasionally seen as a happily domesticated “tamed wildflower” in bog and woodland gardens.